Happy Sabbath, everyone! Today’s post is Sabbath Thought’s very first guest blog, brought to us by a friend of mine, Devon McCaulley. I hope you’ll find it helpful, especially as we continue to approach the spring Holy Day season. And so, without further ado…enjoy! Any of you reading this who know me personally likely know that I play trumpet. Those of you who don’t know me will likely have deduced from the previous sentence that I play trumpet. I have been playing for almost twelve years, and I greatly enjoy being able to play. Three years ago, I had the opportunity to purchase a “new” trumpet. 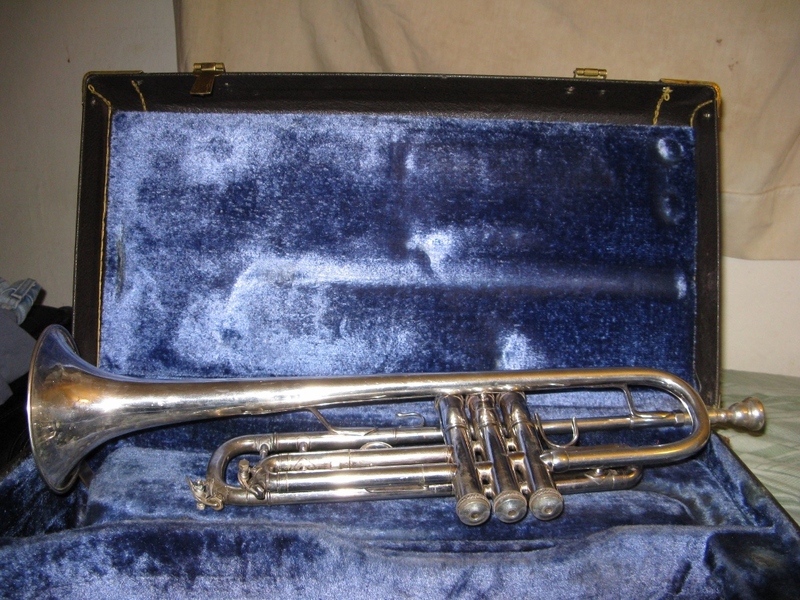 By new, I actually mean a trumpet that is now over forty years old. This trumpet has great value to me personally. In addition to being a fine instrument in its own right, it also belonged to the man who taught me to play. It’s the very first trumpet I ever heard played at Sabbath services, and the man who played it heavily influenced my desire both to play and to serve musically within the Church of God. (From the first time I heard him play the opening fanfare to the hymn God Speaks to Us, I knew I wanted to play like he could.) He taught me not only about music, but about doing so as a service to God and to His people. Consequently, I’m honored not only to own this trumpet, but to use it for the same purpose for which I first heard it played when I was a boy. After purchasing the trumpet, though, I had to complete a very important task before I was willing to play it at Sabbath services. An instrument doesn’t just play itself—playing a musical instrument requires constant practice. The instrument itself, being a manmade object, also requires maintenance. As part of that maintenance, it has to be cleaned. In relation to our preparation for Passover and the Feast of Unleavened Bread, we frequently read that we are to “Examine yourselves as to whether you are in the faith. Test yourselves. Do you not know yourselves, that Jesus Christ is in you?—unless indeed you are disqualified” (2 Corinthians 13:5). Step one in cleaning my trumpet is similar. I have to take it apart. I take off every single slide, remove the valves…basically anything on the horn that can be detached has to be removed, because the entire trumpet needs to be cleaned. By comparison, deleavening our homes is likely the most thorough job of physical cleaning we do during the year. The command to remove all leavening from our homes is not to be taken lightly. In doing so, we are reminded once again of both the difficulty and the necessity of removing sin from our lives—as well as just how invasive sin is. In addition to preparing for Passover, each of us had to examine ourselves prior to baptism—and as we continue to live God’s way of life, we find more and more occasions that, if we’re serious about our calling, will force us to examine ourselves. We examine our lives, attitudes, mindsets, and behaviors—looking for anything that needs to be removed, knowing it can be removed with God’s help. After taking the trumpet apart, I immersed it in a cleaning solution. Did I do this so my trumpet would have a shiny finish? No. The purpose of the cleaning was to clean the inside of the trumpet. As I soaked the horn, I started to notice what I can only describe as gunk coming out of the trumpet and into the horn. (And yes, gunk is the technical term.) It was simultaneously disgusting and interesting to see what came out of the trumpet. At the risk of sounding gross, when you play a wind instrument (brass or otherwise) for any length of time, your saliva ends up in the aforementioned instrument. If you’ve eaten prior to playing, bits of food can also go into your instrument. You’re also blowing hot air against cool metal, so condensation occurs. Add all of that together and gunk just builds up. Left untreated, this can damage the trumpet. Woe to you, scribes and Pharisees, hypocrites! For you cleanse the outside of the cup and dish, but inside they are full of extortion and self-indulgence. Blind Pharisee, first cleanse the inside of the cup and dish, that the outside of them may be clean also. Woe to you, scribes and Pharisees, hypocrites! For you are like whitewashed tombs which indeed appear beautiful outwardly, but inside are full of dead men’s bones and all uncleanness. Even so you also outwardly appear righteous to men, but inside you are full of hypocrisy and lawlessness. The Pharisees knew how to “dress the part,” but Jesus Christ knew their lawlessness. How often do we seek to dress the part as well? As I hope we all understand, God is not fooled by hypocrisy. He knows what each of us does, and he knows the gunk that we each have inside that needs to be removed. Remember what we’re told by the author of Ecclesiastes: “For God will bring every work into judgment, including every secret thing, whether good or evil” (Ecclesiastes 12:14). Getting back to my trumpet, I could have played it without cleaning it, but the inside mess would have still been there. Left alone, it would have only gotten worse. In fact, over time, it has gotten worse. I recently learned that parts of the trumpet are beginning to show signs of something called “red rot,” which basically means the brass is corroding from the inside out. Those parts of the trumpet will have to be replaced, if I’m to continue to play it. If they aren’t, they will just break and become useless. That being said, it’s worth noting that for the time being, I can still play the trumpet without replacing any parts to it. By comparison, we ourselves are still existing in decaying, corruptible human bodies. In His mercy, God still chooses to work with us, but He will not leave us as we are. As we’re reminded by Paul, “Now this I say, brethren, that flesh and blood cannot inherit the kingdom of God; nor does corruption inherit incorruption” (1 Corinthians 15:50). Cleaning out the trumpet took time and work…and it’s not something I can do just once, any more than we can bathe one time and expect that to suffice when we continue to get dirty. Likewise, cleaning out ourselves takes time, work, and it’s not a one-time occurrence. As God works with us, we will continue to have opportunities to see leaven that needs purged and gunk that needs cleaned. Ultimately, though, it’s God who’s doing the real cleaning—and we’re promised that He will finish the work He has started (Philippians 1:6). Let’s each of us then, with God’s help, examine ourselves thoroughly, purging out the old leaven so that we may eat the unleavened bread of sincerity and truth. 6 Responses to "Lessons from Cleaning a Trumpet"
The fanfare before “God Speaks to Us” makes me wish that I could play trumpet, but I don’t. Thank you for your visual desription of your trumpet cleaning. That will come to my mind this week as I prepare for Passover. Good, timely lessons. Wish I could hear that trumpet! Very well said and written, Devon. This analogy really sets things in perspective, and also was done, in proper note, for a pleasing sound! Good blog post, Devon! I am now off to clean MY trumpet now!